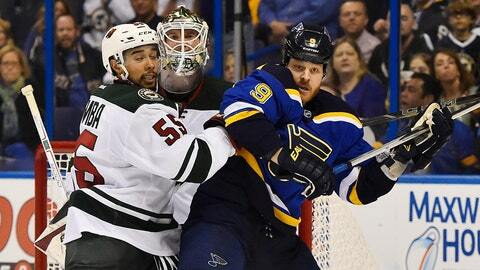 Minnesota Wild defenseman Matt Dumba, left, has even more reason to get a bit physical in front of the home fans. Minnesota Wild defenseman Matt Dumba plans to get physical for a worthy cause this season. Dumba pledged to donate $100 to the charity “Defending the Blue Line” for each hit he officially records on home ice in 2015-16. The 21-year-old's mission is called “Hits for Heroes”. “Defending the Blue Line provides great assistance for military families and I’m proud to support them with a program fans can get excited for and track throughout the Wild season,” Dumba told the team's website. Defending the Blue Line's goal is to ensure “that the children of military members are afforded every opportunity to participate in the game of hockey,” according to its website. The non-profit organization claims David Backes (St. Louis), Derek Stepan (New York Rangers), James van Riemsdyk (Toronto) and Charlie Coyle and Nate Prosser (Minnesota) as endorsing members. Dumba recorded 42 hits to go along with his eight goals and as many assists in 58 games last season. The seventh overall pick of the 2012 draft, Dumba scored two goals and set up two others during the Wild's two-round stint in the playoffs.